This compartment houses the Number One and Number Two main engines. There is a platform deck between them. About one-half of the engine and a generator for each is below this deck. Each of these 16-cylinder diesel engines produce 1,600 horsepower and directly drives its 1,100 kilowatt DC electrical generator. In the Diesel-Electric system used by the U.S. Navy the engines are not mechanically connected to the propellers but only produce electrical power. The submarine's propellers are driven by electric motors at all times. Electrical power for these motors can come from either the batteries (while submerged) or the diesel-driven generators when running on the surface. COD's engines were built in Cleveland, Ohio by the Cleveland Diesel Division of General Motors. At the forward end of the room are the two fresh water distilling plants. Each of these can produce up to forty gallons of very pure water per hour. After they are lit off, it takes an hour or longer to start making water, and no less than 600 gallons are used per day while on patrol. They are in constant operation almost all the time the submarine is on the surface. The water from the stills has to be tested every forty gallons. This is done to see if it is absolutely salt free. Salt free water goes into the battery water tanks to be used to make up for water lost by the batteries through evaporation and electrolysis. Even a small amount of salt in this water will react with the acid in the batteries to form deadly chlorine gas. 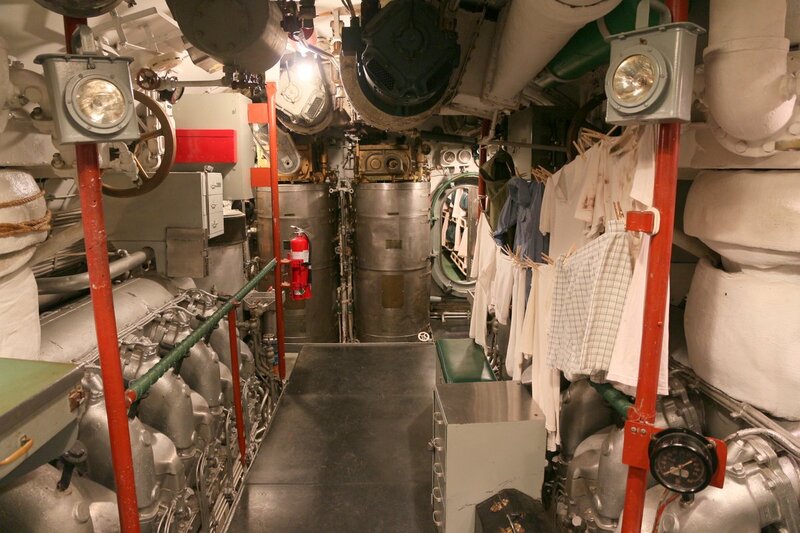 The primary purpose of the two distilling plants on board U.S. submarines is to provided plenty of fresh water for the 256 battery cells, and there is usually enough extra for the needs and comfort of the crew. The showers and clothes washing machine are often in use while at sea, and the mess cooks never have to improvise for clean fresh water for cooking or washing dishes.